With OSB 10.3 ( BEA Aqualogic Service Bus ) you can call BPEL services with the ormi or opmn protocol ( just like OESB ). With version 10.3, OSB support the bpel 10.1.3.4 transport. In this postI will show you how to call the BPEL services from OSB. Calling OSB services from BPEL is also possible but I’ll explain this in an other blog entry. I got this working with the MLR5 patch for Soa suite 10.1.3.4. Step 2 is to replace the bpel jars in the bpel transport ear. Go folder osb_10.3libtransports and open bpel10gtransport.ear and replace the following jar files orabpel.jar, orabpel-common.jar , xmlparserv2.jar and oc4jclient.jar with the ones you can find in the soa suite 10.1.3 home. 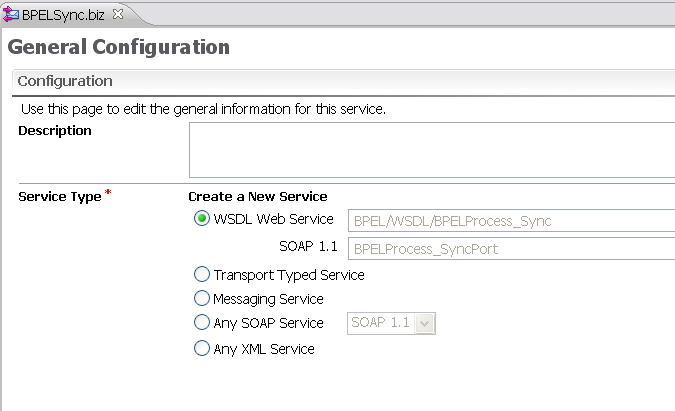 First we create a proxy service in the OSB where we use the WDSL of the BPEL service. Create message flow where we call the Business service which uses the BPEL transport. Select the bpel-10g transport. As endpoint we can choose between opmn or ormi. For ormi we can use this url ormi://localhost:12401/default/BPELProcess_Sync Where 12401 is the rmi port of the OC4J container and BPELProcess_Sync is the name of the BPEL service. Don’t use orabpel in the url. You can also use opmn://localhost:6003/home/default/BPELProcess_Sync where 6003 is the opmn port and home is the name of the OC4J container. That’s all for a Synchronous BPEL service. For an Asynchronous BPEL we have to do a little more. See this overview picture. Import the wsdl of the Asynchronous BPEL process and use this in a new Proxy Service. Do the same for a new Business service, this business service is called from the message flow of the just created proxy service. Select as protocol bpel-10g and use as endpoint opmn://localhost:6003/home/default/BPELProcess_Async. Now we create a call back proxy service where we select the callback operation of the BPEL service. this proxy service calls a business service with the same BPEL wsdl callback operation. that’s all for the Asynchronous BPEL service. For more information see the OSB bpel transport page. I found this useful post at edwin’s blog and then decided to save it to my blog for future reference. Hello, I have a question, if the Oracle BPEL Process Manager and JDeveloper, allow me to do the same that in Oracle Service Bus (OSB), related to orchestration, transformation, service calls, etc., then what would be the real difference OSB, ie that I would have an ESB if the BPEL Process Manager and JDeveloper would perform the same. Thanks in advance, awaiting your response Dalila. I have a post that talks about when we should use each of these components. There is a certain overlap between the functionality provided by these components.